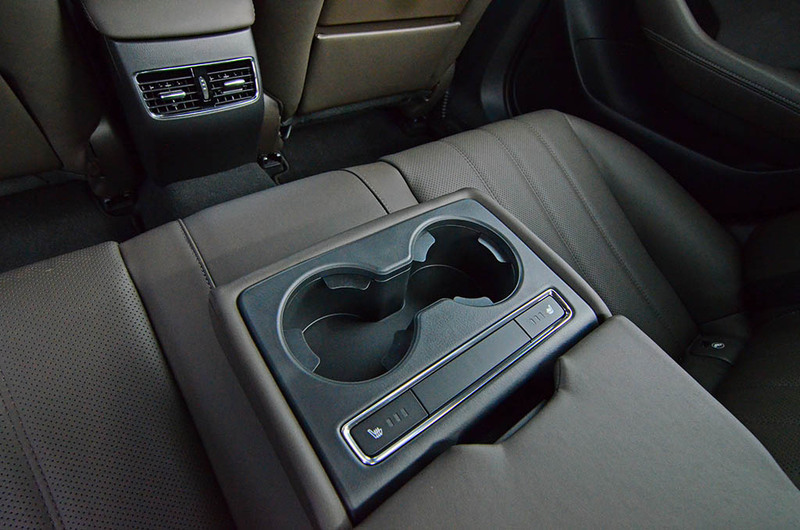 There are times that I am enamored by new offerings come out of certain vehicle brands, in addition to embellishments that improve upon certain aspects of a current model. Mazda has been a brand that kept to their traditional roots with sporty flavors of vehicles segments that sold in record numbers from other automakers year after year. 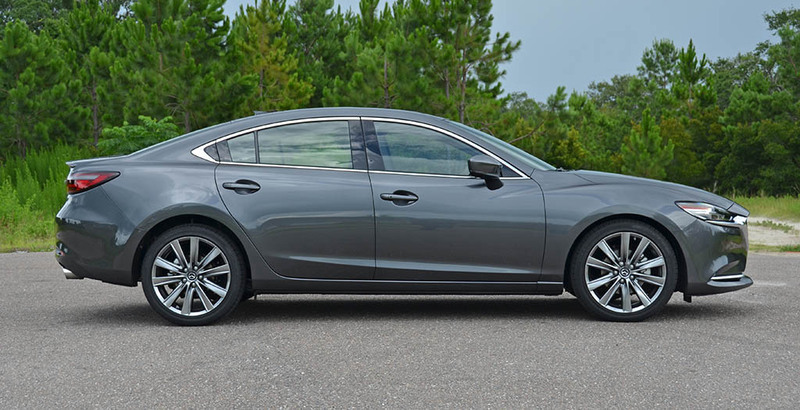 Even though Mazda has never captured class-leading sales, many of their newest offerings are deserving of a closer look considering the exceptional value, sleek styling, fun-to-drive nature, and newfound performance out of vehicles like the new 2018 Mazda 6 Signature 2.5T. 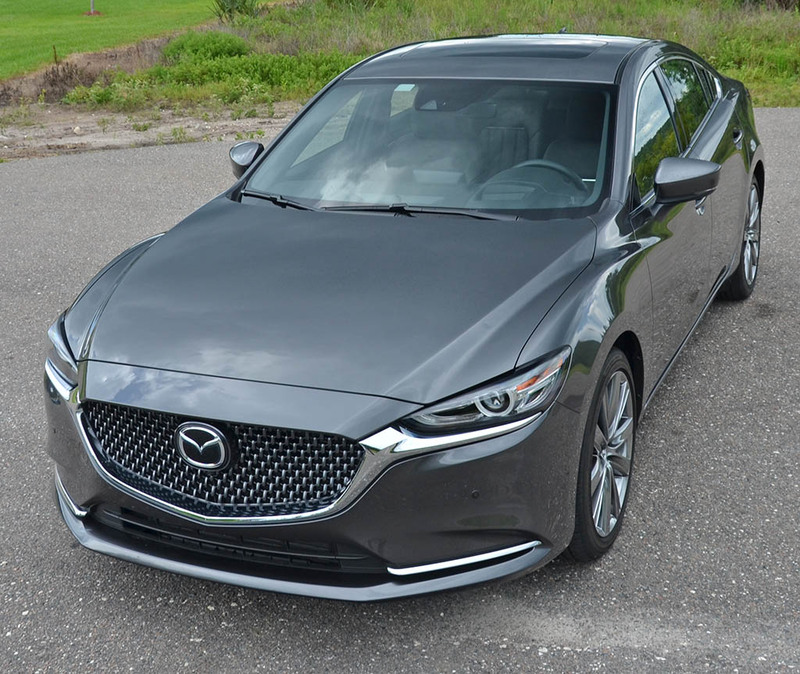 I had a week to experience the best of what Mazda has to offer in their mainstream midsized sedan, a vehicle that as no shame in taking the likings of the Toyota Camry and Honda Accord head-on. 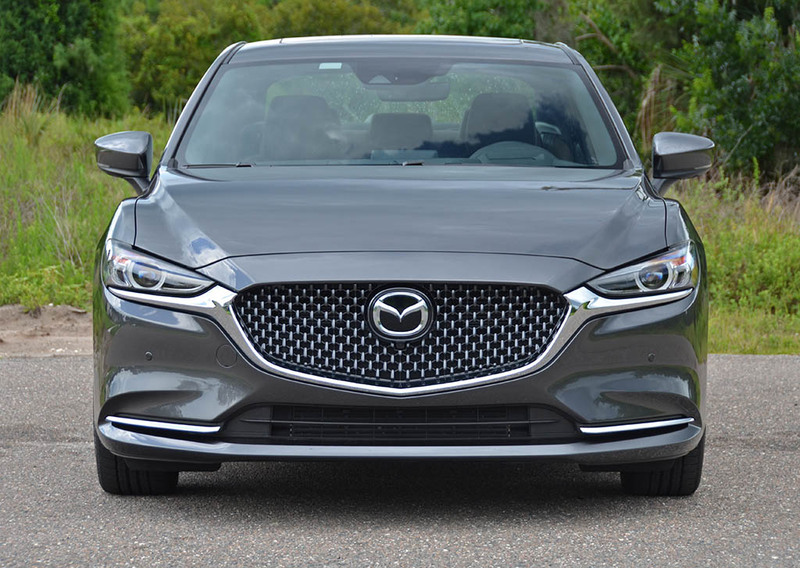 The biggest change for the 2018 model year is the Mazda 6’s new engine for the Grand Touring, Grand Touring Reserve, and Signature trim levels, in addition to a refreshed exterior and two new premium trim levels (Grand Touring Reserve and Signature). 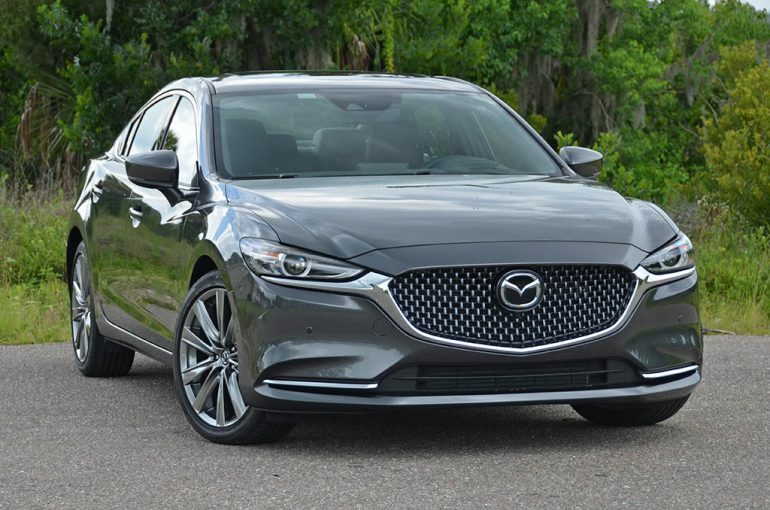 Departing from the still-available base Sport trim and Touring trim’s well-to-do naturally aspirated 2.5-liter 4-cylinder engine with 187 horsepower and 186 pound-feet of torque, the upper-level trims (Grand Touring, Grand Touring Reserve, and Signature) of the new 2018 Mazda 6 literally inject a ‘boost’ into the formula with a new 2.5-liter turbocharged engine boasting a healthy 250 horsepower (with premium fuel / 227 hp with regular fuel) and a robust 310 pound-feet of torque. 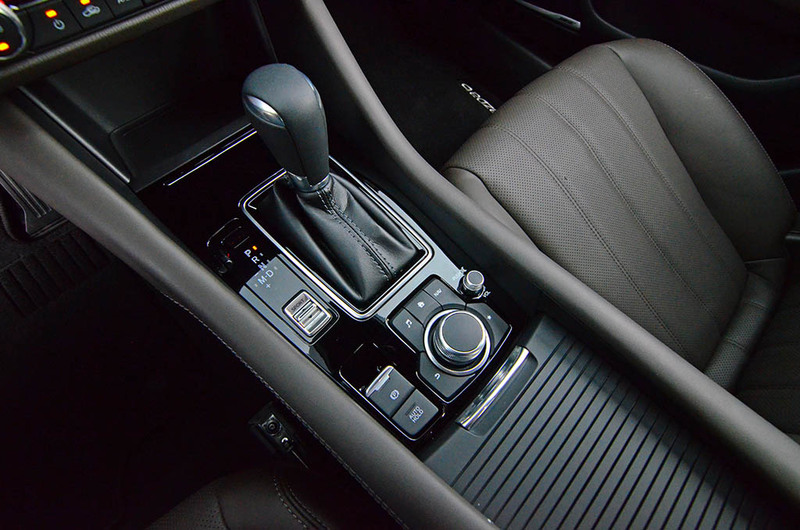 Just like the base engine, the new turbocharged variant gets mated to a 6-speed automatic transmission. The direct-feeling of the 6-speed automatic makes due with a program remapping to better suit the hearty mid-range RPM of the boosted engine. It is there, mostly from standstill up to about 5,500 rpm, that power surges with authority and sometimes induces front wheel spin. After around 5,500 rpm up to redline, at about 6,300 rpm, the engine doesn’t add any additional power. 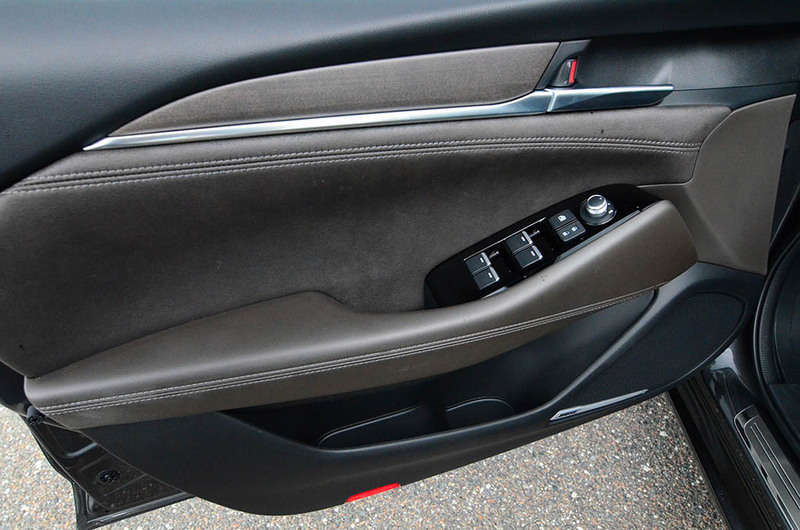 In fact, the power feels as if it drops off a bit as you inch past 5,500 rpm, which is about where the transmission will make its shift into second gear after a hard push out of the hole. 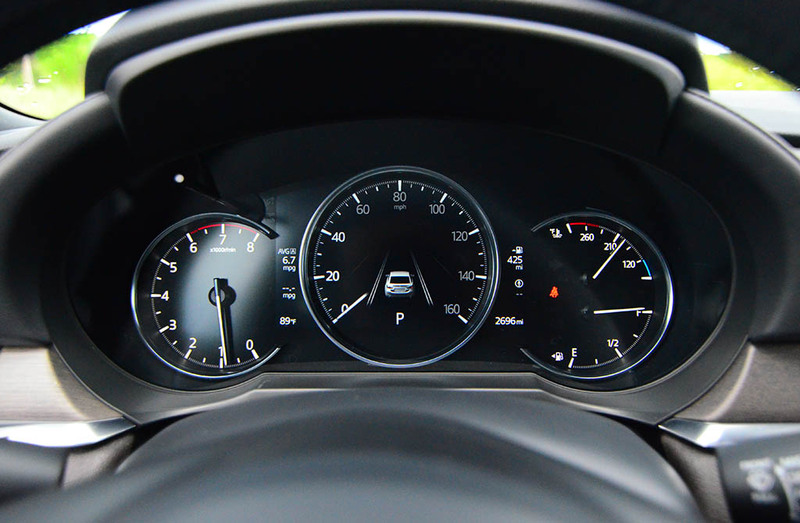 Reaching 60 mph is done in about 6.4 seconds, which is slightly shy of the Mazda 6’s competition that sport the larger available engine. Even though the Mazda 6 Signature 2.5T doesn’t ‘boost’ to 60 mph as fast as its competition, it has merit in real-world driving situations and its underlying sportiness that nicely blends a real taste of luxury. 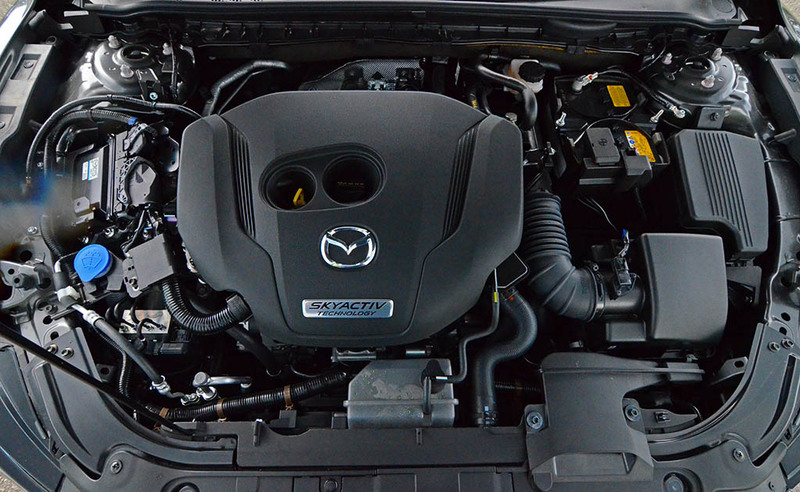 The move to forced induction has been the new trend, and the Mazda 6 has jumped on the movement but has done so to keep costs down yet instill the sporty character that Mazda buyers enjoy. 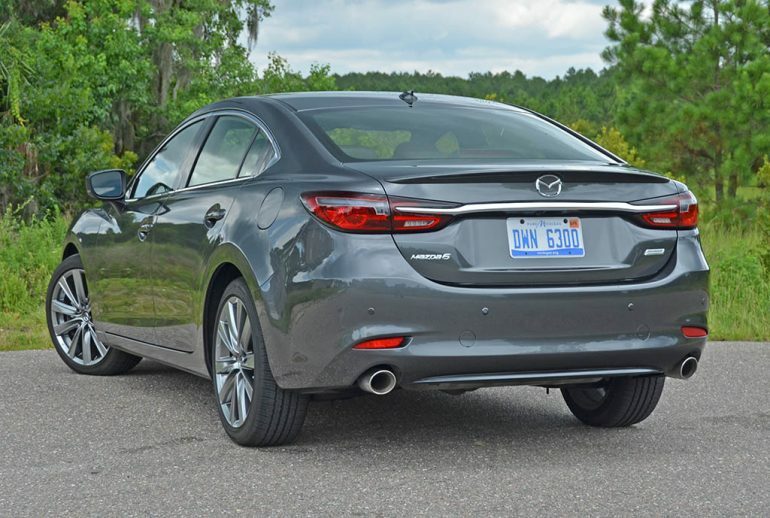 In all, the performance of the Mazda 6 is in the middle of the row but provides a substantial leap over the base models of the midsized sedan segment. 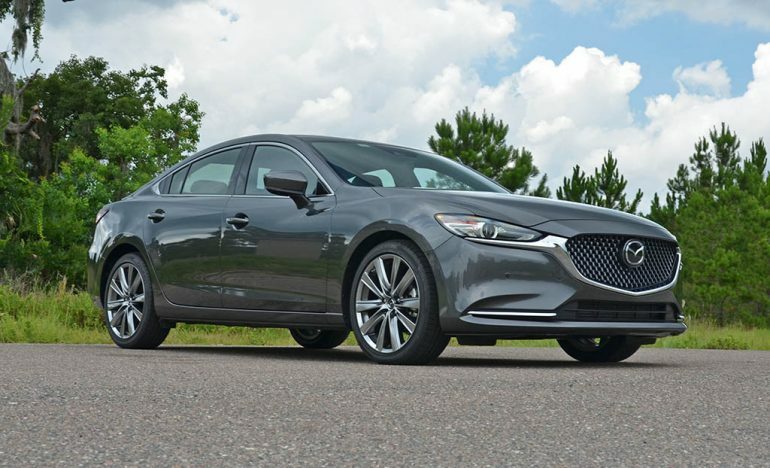 With that, mostly from its substantial 310 pound-feet of torque – a figure none of the competition can best, the Mazda 6 delivers plenty for most. The fuel efficiency of the new Mazda 6 Signature 2.5T is nearly on par with its competition but can vary greatly as I noticed during my time driving on the highway at different speeds. 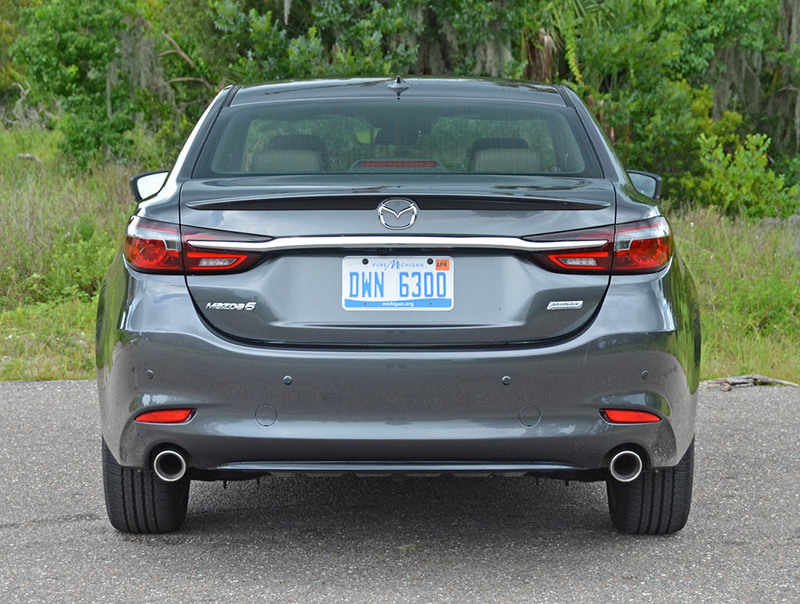 At a steady 65 mph, the Mazda 6 does well to return a better MPG number than its EPA-estimate of 31 mpg highway. Pushing past 75 mpg on up to 80 mph things start to drastically change to fall just below the 31 mpg target, sometimes as low as 28 mpg. Around town, the figures start to look more consistent with about 23.5 mpg in the city while pushing the engine a little hard using up the surging torque. 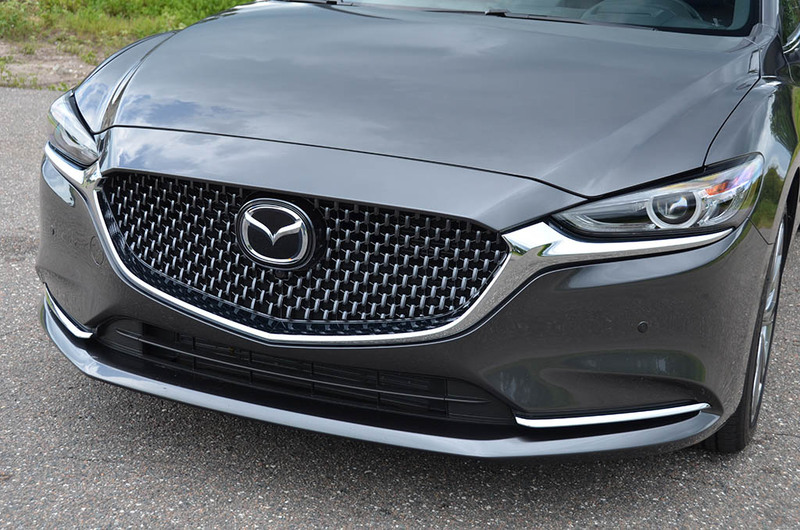 The primary limiting factor of the Mazda 6’s performance is its tires, where they didn’t appear to be up to the task of handling the 310 pound-feet of torque leaving traction and stability control enacting quite often to save the day. There is an inherent feeling of the Mazda 6 that gives you plenty of confidence in its nicely balanced ride quality with a dash of sport and luxury intertwined into the chassis. Here, again, the lateral handling probably could be better with wider and better-performing tires, apart from the 225/45R19 Falken Ziex ZE001 all-season rubber on my test vehicle. 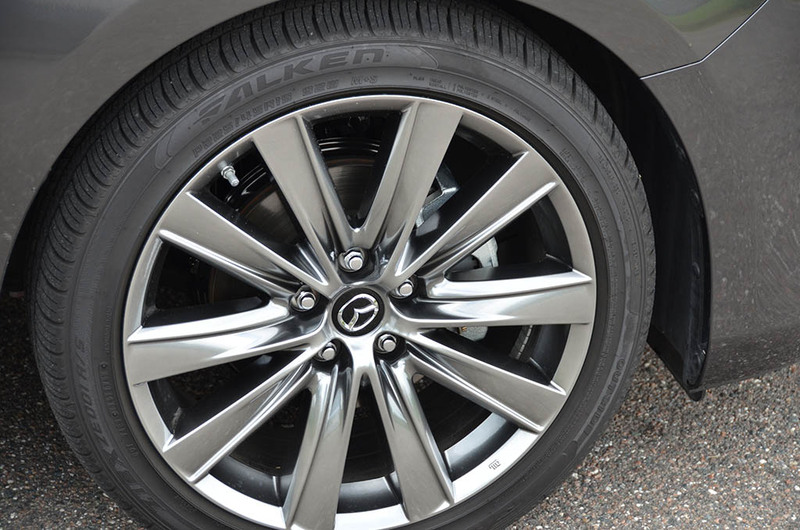 Moreover, acceleration and braking times may also improve with the right tires wrapping the stylish 19-inch alloy wheels. 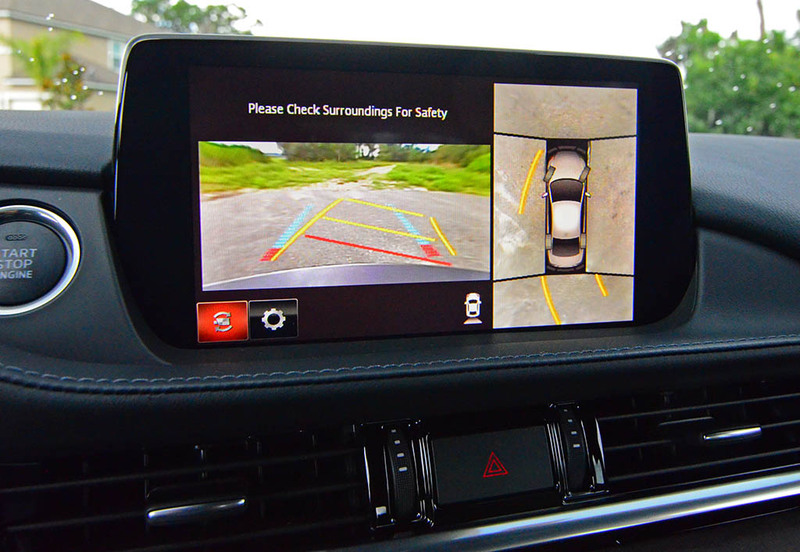 On the side of safety, Mazda keeps it real with a plethora of active safety features, including forward collision warning with mitigation, lane departure warning and mitigation, and blind spot monitors, which are all notified through the color heads-up display. The use of adaptive cruise control and the enabled lane departure systems help navigate the Mazda 6 through roads with clearly painted lines. 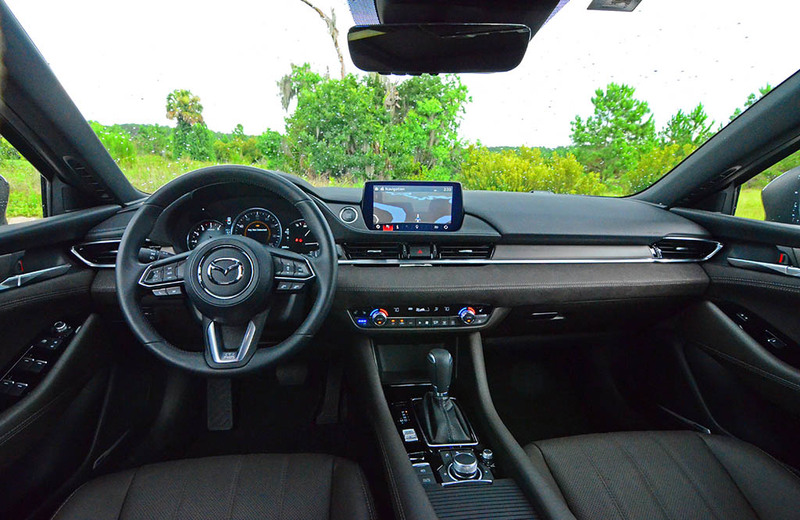 Mazda has been known in recent years for their upscale interior refinement with cabins in most of their vehicles that rival out-right luxury brands. 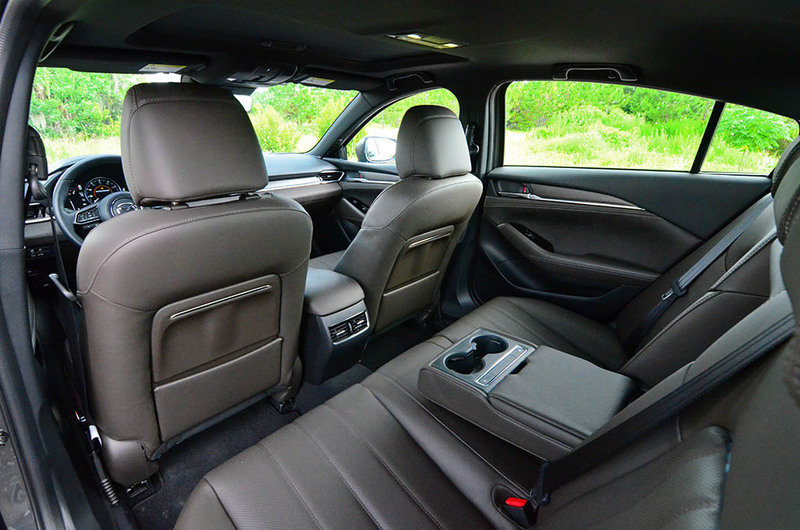 Despite the lack of contrasts in the cabin, the Mazda 6 Signature at the top of the trim level exudes a nice taste of luxury with plenty of soft-touch surfaces, thickly-padded floor columns of the dashboard, perforated leather seats (heated and ventilated front and heated rear outboard seats), and good overall fit and finish. 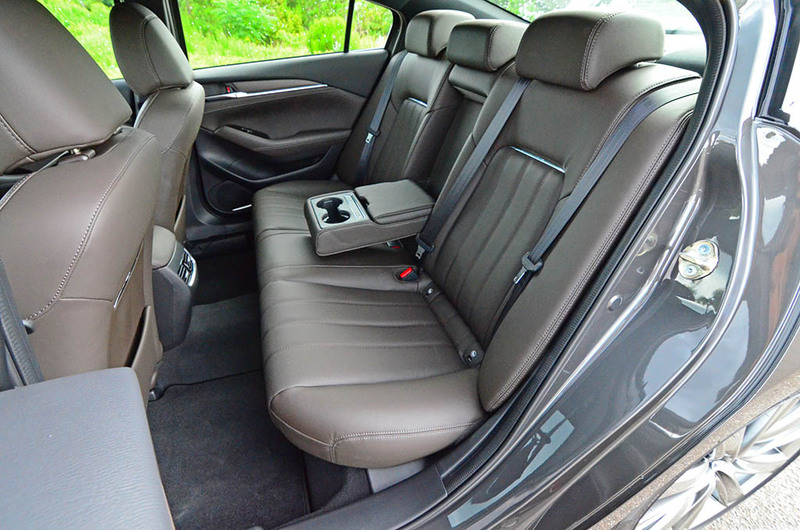 Additionally, the cabin is solid in its feel and relatively quiet with acoustic laminated glass up front, special attention to cleverly-placed sound deadening, and the welcomed rollout of Apple CarPlay and Android Auto integration. 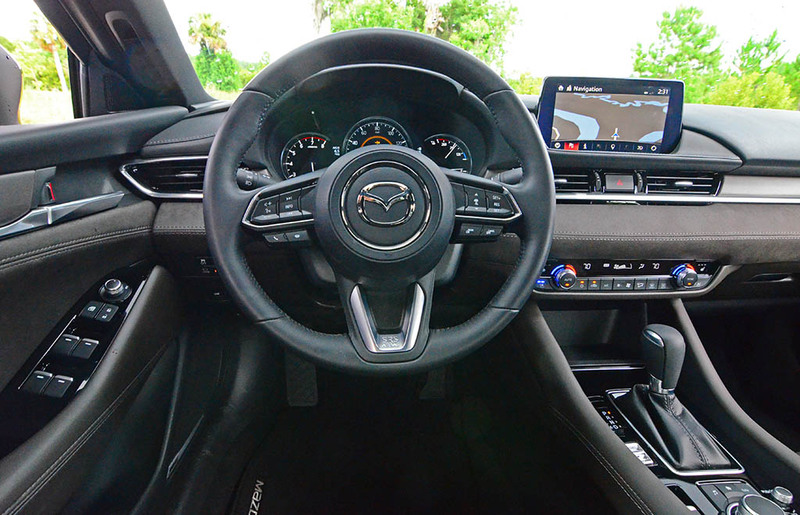 My test vehicle, along with other current 2018 models, don’t include Apple CarPlay or Android Auto but Mazda has assured me that the equipment will be available in months to come and fed through the already-welcomed high-mounted infotainment screen. 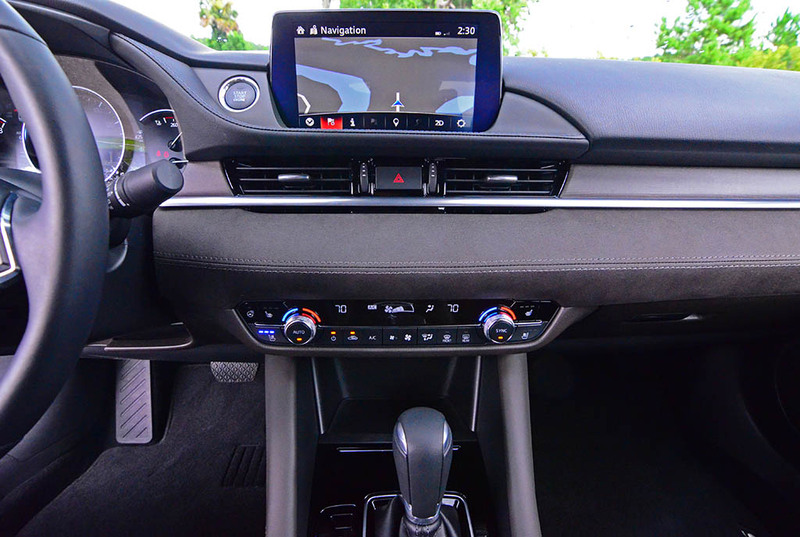 The 7-inch screen serves as a touch screen when the vehicle is stopped but otherwise controlled by the brand-familiar central dial and dedicated function buttons that also group the volume knob at the low point for easy reaching from your right hand and arm resting on the center armrest. 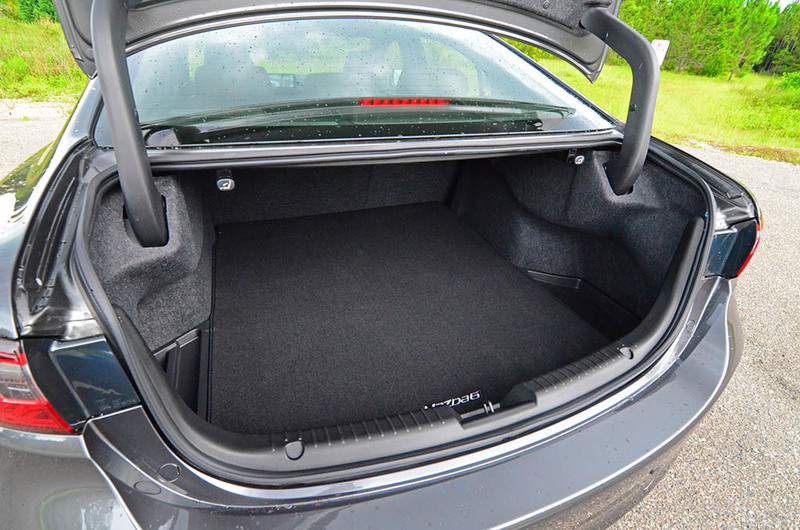 Potentially the best part of the Mazda 6 is its value that has a competitive pricing point starting at just $23,000 for the base Sport trim and only reaching $36,140 as-tested for my top-level – loaded-up – Mazda 6 Signature 2.5T test vehicle. 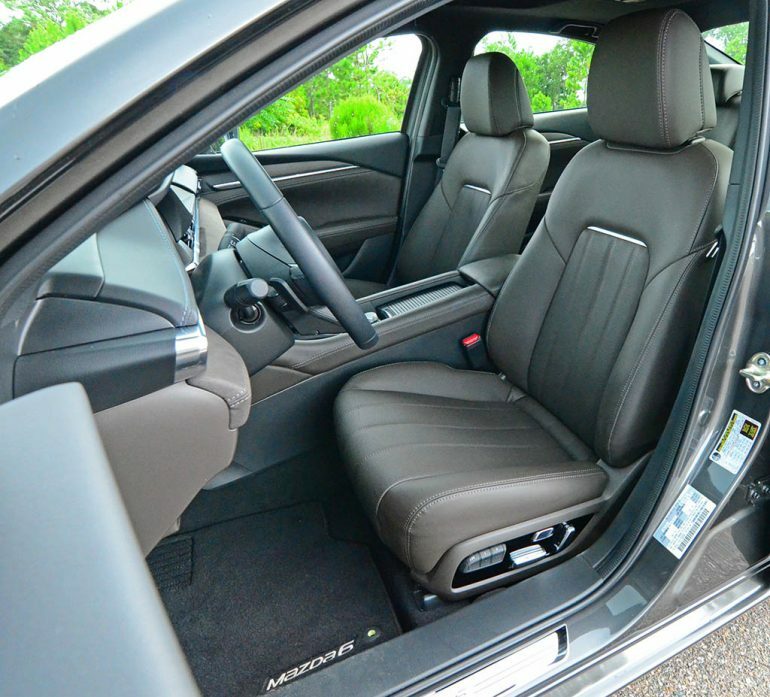 At such a price, which is about 3,000 less than a comparable Toyota Camry XSE V6 but on par with the Honda Accord Touring, the new Mazda 6 is well deserving of a close look when shopping for a midsized sedan that has the availability of highly sought-after features, a premium interior, and a uniquely stylish and sporty character.